One of the most important activities of the Society is publication. We publish a good many books and the following periodicals. Polymer Journal is a high quality international journal which has been published monthly in English by SPSJ since 1970.It presents you up-to-date results of scientific research and new information in all the fields of polymer science. It includes regular articles, notes, and communications, covering the whole range of polymer science: polymer syntheses and reactions, polymer structures, physical properties of polymers, functional polymers, biopolymers, and polymer engineering. Kobunshi Ronbunshu (Japanese Journal of Polymer Science and Technology) is published monthly in Japanese by SPSJ since 1944.It includes original papers, notes, short communications, and comprehensive papers.It covers the whole range of polymer science and technology. Abstracts, tables, and figures are written in English. Kobunshi (High Polymers, Japan) is a journal published monthly in Japanese by SPSJ as the organ of the Society, and its first issue appeared in 1952. It includes reviews, reseach papers, reports, news, announcements, calendar of meetings, and other information. 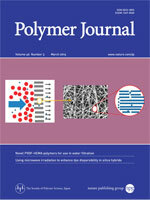 Polymer Preprints, Japan (English Edition) is published twice a year by DVD-ROM. The preprints consist of the abstracts of all the papers presented both at the Annual meeting in Spring (about 2,200 papers) and at the Symposium on Macromolecules in Fall (about 2,000 papers).